Watch for another star-studded Billboard Music Awards show presentation to be televised on Wednesday, May 1, 2019 beginning at 8:00 PM ET on NBC with a delayed broadcast on the West Coast at 5PM PT. Canadian fans can also tune into CTV2 for the full broadcast. 2019 Billboard Music Awards nominees have already been announced, with Cardi B nominated 21 times in 18 categories. She will also compete against herself in three categories -- top Hot 100 song, top selling song, and top collaboration. Drake and Post Malone follow with 17 nominations each. Travis Scott is up for 12 awards, and XXXTentacion is up for 10. Returning this year to host the ceremony from the MGM Grand Garden Arena in Las Vegas, Nevada for the second consecutive time is pop music star and coach on "The Voice", Kelly Clarkson. So far, the performance lineup for the 2019 Billboard Music Awards includes host Kelly Clarkson, along with Lauren Daigle, Panic! At The Disco, Normani, Sam Smith, and Khalid. Also watch for special performances by BTS and Halsey performing together at the 2019 Billboard Music Awards, along with a special performance by 2019 Billboard Icon Award, Mariah Carey - along with the return of the Jonas Brothers! Meanwhile, keep it here for more updates including a complete list of performers and presenters, plus the announcement of big winners at the 2019 BMAs. What sets the BMAs apart from most award shows? Based on Nielsen data for sales, downloads and airplay, the BMA Music Awards recognize that fans vote with their pocketbook. Therefore, it's only the most popular recording and touring artists of the year who earn their place on an annual roster of top nominees and winners. Top BMA winners of all time. 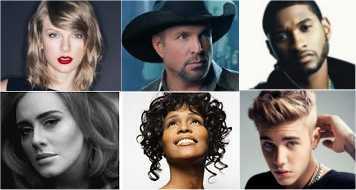 • Among the top winners at the BMA's, Taylor Swift leads the pack with 21 awards -- followed by Garth Brooks with 19, Usher and Adele both with 18, Whitney Houston with 16, and Justin Bieber with 15. • The very first Billboard Awards aired in 1989 when Michael Jackson won for Album of The Year for "Bad" and Janet Jackson Video Of The Year for "Miss You Much". • The Billboard Millennium Award has only been awarded to three people: Beyonce Knowles (2011), Whitney Houston (posthumously, in 2012) and Britney Spears (2016). • The only two artists to win the Spotlight Award (for five consecutive number ones singles from one album) has been Michael Jackson for "Bad" (1988) and Katy Perry for "Teenage Dream" (2012). • The only two artists who can boast multiple wins for Top Male Artist is Eminem (2010 and 2011) and Justin Bieber (2013 and 2016). Billboard - The official site of the award hosts including headline music news, tour dates of favorite artists, album reviews, pop music history, video clips, and related features including the Billboard Hot 100. Billboard Music Awards - Wikipedia entry with a history of the BMA's, list of major winners dating back to 1992, and related resources.